This widely acclaimed, bestselling work on a healthful protein powerhouse and solution to world hunger is more than just a great cookbook with 500 recipes from East and West using eight different types of tofu. It contains instructions for making tofu, soymilk, yuba, and a host of other soyfoods, an illustrated description of making tofu in a Japanese shop, an extensive glossary of Japanese natural foods, detailed nutritional analyses, and a statement of how tofu offers a revolutionary yet simple approach to meeting the world's critical protein requirements; over 125,000 copies in print. Discovered in China more than 2,000 years ago and prepared today in 30,000 shops in Japan alone, tofu is now produced at over 150 shops in North America, where it is widely available. America's bestselling book on tofu, the healthful, low-cost, low-calorie, protein-rich staple that comes in velvety white cakes resembling a soft cheese or firm yogurt and is the world's most popular soyfood. Remarkably versatile, tofu makes creamy dips and dressings, burgers and cutlets, wonderful cheesecakes, and a host of other delicacies for every spot on the menu. Based on the worldwide popularity of the original trade edition of The Book of Tofu , Ballantine has issued an exciting new low-cost edition, extensively revised, Americanized and condensed by the authors. It contains 250 gourmet recipes (many of them new), extensive nutritional information, new sections on dairylike products made from soymilk, soymilk ice cream and yogurt, new chapters, improved recipes for making tofu and soymilk at home, bibliography, and index. Over 360,000 copies sold! This beautifully illustrated companion to the bestselling Book of Tofu introduces miso, a savory, high-protein soy-and-grain seasoning, and describes the six basic types and seventeen most widely used varieties of miso. Contains 400 tasty American and Oriental recipes; instructions for preparing many types of miso (and koji) at home, in communities, and on a commercial scale; detailed nutritional analyses; a history of miso, chiang, shoyu and tamari; a description of the varieties of Chinese chiang, Korean jang and Indonesian taucho; a detailed discussion of the microbiology and biochemistry of miso fermentation; and a guide for studying miso in Japan. Plus a description of soybeans as the protein source of the future, lengthy bibliography, and index. Based on the popularity of the original trade edition and the steadily increasing use of miso in America , Ballantine Books has issued an exciting low-cost edition, updated and revised by the authors. It contains new American-style recipes, new listings of miso shops and resources in the West, new information on miso nutrition and new varieties of miso, plus an extensive new analysis of the early history of miso, tamari, shoyu, and soy nuggets. This handsome companion to the Ballantine edition of The Book of Tofu will surely help to give miso the respected place it deserves in the emerging new American cuisine. The full story of tempeh, a delectable cultured soyfood that tastes like southern fried chicken, contains twice the protein of hamburger. Contains over 130 tempting American and Indonesian recipes, including Tempeh Burgers, Tempeh, Lettuce & Tomato Sandwiches, Crisp Tempeh Chips, and Breaded Tempeh Cutlets. Detailed instructions for making your own tempeh at home, in communities, or in a commercial shop, extensive nutritional information, bibliography of 275 references, lengthy history, listing of all tempeh makers, index, and a discussion of tempeh and world hunger. Prepared fresh daily at 41,000 shops in Indonesia, this delicious, cholesterol-free protein is now widely available in the West. 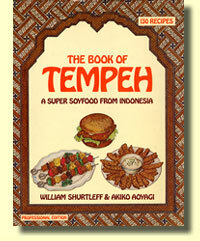 A special hardcover professional edition of The Book of Tempeh prepared for libraries, commercial tempeh producers, microbiologists, students of Indonesian foods, and those who love fine books. In addition to the full contents of the paperback edition, it contains the following lengthy appendixes: The Microbiology & Chemistry of Tempeh Fermentation; Tempeh in Indonesia; The Varieties of Tempeh; Soy-bean Production and Traditional Soyfoods in Indonesia; Ohchom or Ontjom; A Glossary of Indonesian Foods (the most extensive one available in English); a Bibliography of Tempeh Research containing over 190 entries; and an expanded Index. A great deal of original research is contained in the extra 88 pages and 54 illustrations. "..awakened the West to the wonders of tofu." "A landmark volume. highly recommended." "Delicious, easy-to-follow recipes. meticulous. fascinating. highly recommended." "A wealth of recipes and nutritional and cultural information." ". 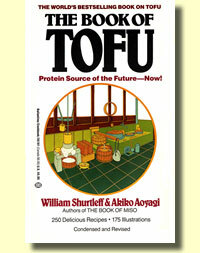 contains all you would ever want to know about tofu." ". written with style and humor. Beautifully illustrated." "Unbelievable in its thoroughness. relevance. practicality." 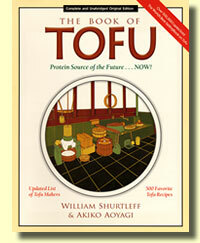 "Among the recent tofu cookbooks put out for the American cook to date, The Book of Tofu. is the most complete and useful." ". everything you want to know about tofu. ideal for home economists, dieticians, those interested in vegetarian high-protein foods made on a home and village scale. and food technologists." "An awesome book about the most incredible of foods." 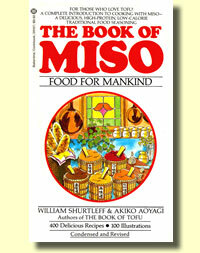 "The most important book on food ever published for vegetarians - if not for all the world. Clear prose and beautiful illustrations take you step by step through tofu making at home. Buy this book!" "A sizeable, sensible step toward the New Protein Consciousness." "The Book of Tofu is an inspiration." "This book started the movement that has taken tofu from the rare Chinese food store into the kitchens of modern America." ". crammed full of historical information, traditional and western recipes, explicit instructions for homemade miso, and fascinating facts about the place of miso in Japanese life." ". numerous excellent illustrations. 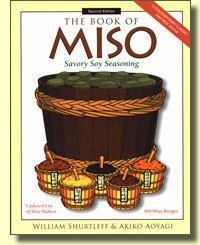 contains a thorough survey of Japanese miso as well as many recipes based on the author's personal experiments. Useful as a guide for food technologists, home economists, dieticians, and others interested in fermented soybean products." "The Book of Tempeh, prepared with such care, should be read by all who would like their eating pleasures to match their political understanding." "Stunningly impressive in its thoroughness and vastly wholistic in its vision. A milestone in the accelerating soyfoods renaissance. An unparalleled success." "Unique in focus and truly excellent treatment. highly recommended." "The research is thorough and the recipes are mouth-watering." ". an invaluable handbook. the sole practical guide for making Tempeh at home or on a larger scale." "A trailblazing work on a little-known but much-loved food in Indonesia. the definitive word on a food well worth knowing." "Tempeh is on its way up. Before long it will be eaten widely and lovingly across this land of ours. I'm convinced that Tempeh is just sitting there waiting for lightning to strike, the way it hit yogurt. All the signs point to that happening, and soon." "Clear instructions and excellent illustrations. Several appendixes are specifically valuable; the best is the "Microbiology and Chemistry of Tempeh Fermentation." A truly readable and useful reference book. Highly recommended for food technologists, home economists, extension specialists, and individuals considering starting tempeh shops." "Carries on the tradition of excellence established by The Book of Tofu. If you have used that modern classic or The Book of Miso you have no doubt come to expect nothing but the best from these authors: an historical and cultural context, thorough research, complete nutritional analysis, delectable recipes, and profuse illustrations. Add to that a compelling analysis of the stark picture of world hunger and the revolutionary role of soyfoods in meeting critical protein shortages, and you have the formula of Soyinfo Center books. 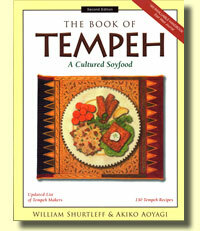 This latest is a bright and lively account of what will surely be one of the most important foods of the future - tempeh."